READ: Instructions For The Jury In Trial Of George Zimmerman : The Two-Way The defense is expected to finish its closing argument on Friday. Then, Judge Debra Nelson will instruct the jurors on what they are to consider as they weigh whether George Zimmerman acted in self defense or should be sent to prison for the shooting death of Florida teenager Trayvon Martin. George Zimmerman in court on Thursday. Nearly 17 months after the shooting death of 17-year-old Trayvon Martin — a death that would spark protests across the nation — a jury is about to begin considering whether defendant George Zimmerman acted in self defense or should be convicted of murder or manslaughter. 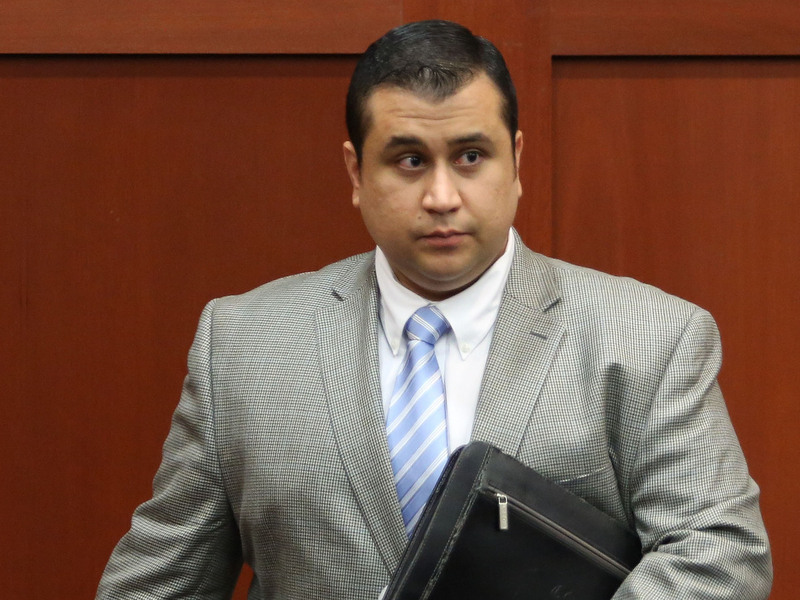 Zimmerman's attorneys are expected to wrap up their closing arguments Friday in a Sanford, Fla., courtroom. Then, Judge Debra Nelson will read her instructions to the jurors — guidance that the prosecution and defense spent hours debating on Thursday. Every line of the instructions was fought over by the attorneys. We've put the document online and in a box we'll embed below (just click on the title, "George Zimmerman Trial: Final Jury Instructions," to pop up a larger version). Read through to see what Judge Nelson will say and what the jurors will be considering as they debate Zimmerman's fate. Trayvon was killed on Feb. 26, 2012, in Sanford. Zimmerman, a self-styled neighborhood watch volunteer, says he acted in self defense. Trayvon's family and supporters say Zimmerman, now 29, racially profiled the young African-American and should not have been following the unarmed teen. The case ignited a national debate after Trayvon's family called for Zimmerman's arrest and accused local authorities of not properly investigating the young man's death. If you'd like to look back at how the story developed, we're also attaching a timeline based on our headlines since March 2012. — March 19, 2012: Killing Of Fla. Teen Trayvon Martin Becomes National Story About Race. — March 20, 2012: Trayvon Martin Killing To Be Investigated By Florida Grand Jury. — March 21, 2012: 'Million Hoodie March' Planned In New York To Protest Killing Of Trayvon Martin. — March 23, 2012: Obama: 'Absolutely Imperative' That Trayvon Martin's Death Be Investigated. — March 29, 2012: Three Key Moments As Trayvon Martin's Story Went Viral. — April 11, 2012: Zimmerman Arrested On Murder Charge In Martin Case; Will Plead Not Guilty. — June 1, 2012: George Zimmerman's Bond Revoked, Must Surrender Within 48 Hours. — July 5, 2012: Zimmerman's Bail Set At $1 Million. — Oct. 17, 2012: June Trial For George Zimmerman, Accused In Trayvon Martin Death. — June 10, 2013: Trayvon Martin Killing: 2 Sides Want Very Different Jurors. — June 24, 2013: George Zimmerman Trial: 3 Highlights From The First Day. — July 5, 2013: That's 'My Son Screaming' On 911 Call, Trayvon's Mother Says. — July 8, 2013: At Murder Trial, Friends Say It's Zimmerman's Voice On Tape. — July 10, 2013: Defense Rests In Zimmerman Trial; Race 'Permeates The Case'. — July 11, 2013: Zimmerman Jury Can Consider Lesser Charge, Judge Says.